The SXSW Interactive Innovation Awards have a long history of providing cutting-edge technologists and budding startups the opportunity to pitch their work to the SXSW audience and investors. In its rich 22-year history, Innovation Awards alumni have included Hulu, Airbnb, Getty Images, Groupon, Soundcloud, Pinterest, and more! Learn how you can join the alumni list and be a part of the event by showcasing your work at SXSW 2019 – but don’t wait! The final entry deadline is Thursday, November 15 at 11:59pm PT. 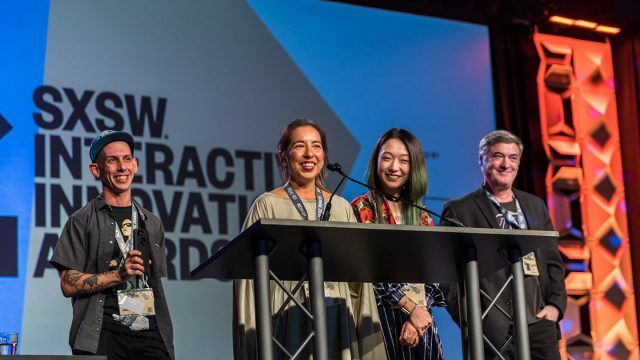 The SXSW Interactive Innovation Awards highlight the most exciting tech developments in the connected world. Each year, finalists are invited to SXSW to exhibit their digital projects, products and discoveries during the Interactive Innovation Awards Finalist Showcase. Five selected finalists in each of the 13 categories will receive two registrations to attend SXSW 2019 and a space to demonstrate their project for SXSW attendees and Innovation Awards judges. Innovation Awards judges will experience each project hands-on and vote to determine the winner in each category as well as the winner of the Best of Show Award. SXSW Interactive’s annual awards program began in 1997 as the Texas Interactive Media Achievement Awards, and was re-dubbed the SXSW Web Awards the following year. As the range of ingenuity in the digital space grew, the competition evolved to become the Interactive Awards, and ultimately expanded into the Interactive Innovation Awards, reflecting the increasingly multifaceted and diverse ecosystem of technological achievement and creative work. We caught up with a few of our 2018 Interactive Innovation Awards winners and finalists to hear about their experiences – read on. Penrose is a group of artists, engineers and storytellers pushing the boundaries of virtual and augmented reality. Penrose’s mission is to define the next generation of human storytelling. The team pushes the boundaries of entertainment through immersive experiences that explore universal themes of family, love, loss, fear, and sacrifice. As finalists in the Innovation in Connecting People category at the 2018 Interactive Innovation Awards, Penrose Studios celebrated and presented their VR project and technology to the SXSW audience. Developed by scientists at the University of Texas at Austin, the MasSpec Pen is a breakthrough device that can detect cancerous tissue in real time. The MasSpec Pen is a handheld pen-like device that rapidly identifies the molecular profile of tissues using a small volume water droplet and mass spectrometry analysis without damaging tissue. Proud winners of the Health, Med, & BioTech category at the 2018 Innovation Awards, MasSpec Pen has huge potential to revolutionize healthcare and cancer research. Browse the full list of 2018 Interactive Innovation Awards finalists and winners and get inspired to enter your own project for a chance to exhibit at the 2019 Innovation Awards. If you’re considering submitting your work and joining us at the 2019 event, check out our tips to make sure your entry stands out. Keep in mind that deadlines are final. Your project doesn’t have to be fully launched as of right now. It’s okay to submit an application for a project that is in the works. Regardless of what stage of completion your project is in, you must submit your application for the Innovation Awards before the final deadline of Thursday, November 15 at 11:59pm PT.